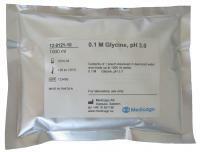 Medicago’s Glycine-HCl buffer can be used for reactions when pH must be maintained at 3.0. The buffer can be used as elution buffer in affinity chromatogaphy (1) for example antibodies from Protein A (2) and lectins. Glycine-HCl is supplied as a powder mix in pouches giving 1000 ml of 0.1 M glycine-HCl with pH 3.0 at 25°C when dissolved in deionized water. Empty one pouch of the glycine-HCl buffer in a laboratory flask or beaker placed on a magnetic stirrer. Add 300 ml of deionized water and stir the solution for a few minutes. Adjust the volume up to 1000 ml, stir until full dissolution and the buffer solution is ready to use. Glycine-HCl buffer is shipped at room temperature. Store the pouches in a dry place at room temperature. Shelf life is three years after production date.